Your first step to maintaining superb water quality in your spa or hot tub could not be easier. 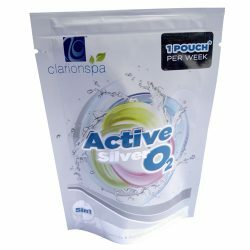 Our ClarionSpa Active Silver Oxygen System is a simple to use 1-pouch-per-week treatment*. This 5-in-1 non-chlorine sanitiser harnesses the unique cleansing power of silver! Our pioneering 5-in-1 synergy ClarionSpa Active Silver Oxygen System is a soft and gentle sanitiser for your spa or hot tub. Being environmentally friendly and completely chlorine free means there will be no more unpleasant chemical odours, no more dry skin or hair, and no more sore red eyes. This system has 5 key functions which include: a sanitiser, an algaecide, clarity control, a comfort enhancer, and added bacteria protection using innovative Active Silver technology. ClarionSpa Active Silver Oxygen System is designed to ensure the easy maintenance of your spa or hot tub. Simply add the required number of pouches directly to the water and enjoy. One full pouch per week will treat an average spa or hot tub of up to 3,000 litre capacity,*for over 3,000 litres use two full pouches. Regular purging, draining and re-filling your spa or hot tub is an essential maintenance task. Using the ClarionSpa EcoPurge Power Puck is your second step to eliminate the hidden and stubborn deposits which cling to the pipework within your spa or hot tub. Our innovative ClarionSpa EcoPurge Power Puck treatment is an environmentally friendly, deep cleaning product designed to clean your spa or hot tub from the inside out. 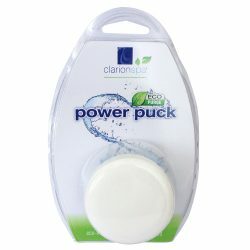 The ClarionSpa EcoPurge Power Puck treatment should be used prior to draining your spa or hot tub. It will remove the accumulated deposits of rust, grease, scale and biofilm from within the pipe work and mechanical parts of the operating system. If left untreated then these deposits will eventually reduce the efficiency and life expectancy of your spa or hot tub. For maximum efficiency and sanitation your spa or and hot tub needs to be drained and re-filled regularly. We recommend carrying out our ClarionSpa EcoPurge Power Puck and drain maintenance process every 3 months. You should also purge and drain your spa or hot tub before initial use after purchase. 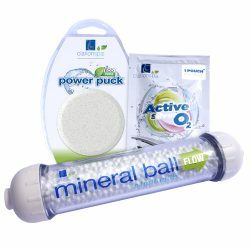 After purging and draining your spa or hot tub with ClarionSpa EcoPurge Power Puck start as you mean to go on with our third step ClarionSpa Mineral Ball Filter to re-fill your spa or hot tub with superbly clear and contaminant free water. The environmentally friendly Mineral Ball Filter is an ‘in-line fill-up’ filter that can be effortlessly attached to your garden hose (TAP CONNECTOR REQUIRED **NOT INCLUDED**). It is positioned between your external mains water supply (outside tap) and your spa or hot tub. 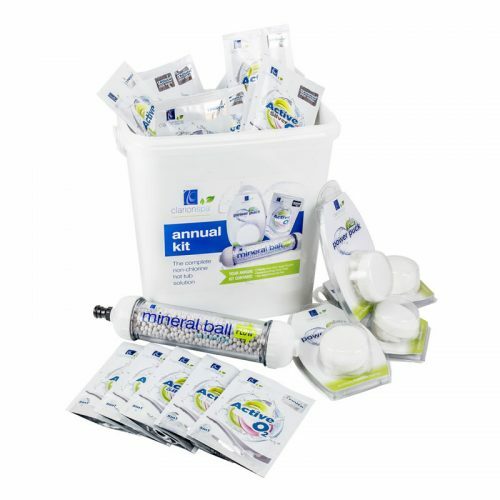 The active ingredients in the inorganic mineral balls are absorbed into your body, re-energising you and replacing vitamins and minerals that your body loses whilst relaxing in warm water conditions. Just one ClarionSpa Mineral Ball Filter treats 12,500 litres of water. This equates to a full year of average usage for a spa or hot tub capacity of 2,500-3,000 litres, based on 4 fresh fills plus top-ups. For maximum sanitation we recommend purging, draining and re-filling your spa or hot tub every 3 months.